We are the AQ Explorer Program! 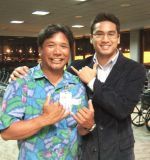 AQ's Community service program who teaches & mentors students ages 16-20 years of age all about Aloha Airlines and Airline Careers in general. Two Programs: The Basic: 10 week course in the Spring of every year (30 students only) and The Advanced: Year round Program of Graduates of past basic programs. Students are from both Public & Private Schools on O'ahu. If interested, please inquire with your high school career counselor.